The Iraqi Army is approaching the Great Al Nuri Mosque. This may be the last stand for ISIS before Mosul is flooded. The Al Nuri Mosque is located on the west side of the Tigris River in downtown Mosul in northern Iraq. ISIS is fiercely defending the Mosque. The Al Nuri Mosque was where ISIS leader Abu Bakr al-Baghdadi announced the creation of his Islamic Caliphate. 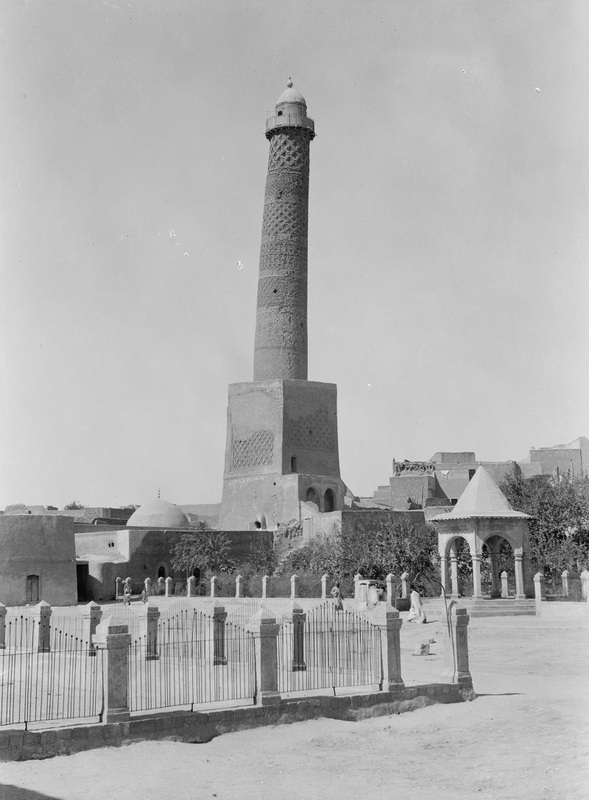 The Al Nuri Mosque was built in 1172 AD and is famous for its 148 foot tall leaning minaret. The Iraqi Army has surrounded ISIS in Mosul and is corralling them towards the heart of the city. The center of Mosul is much more densely populated than the areas that have already been taken back from ISIS. The downtown streets are narrower making it difficult to maneuver armored vehicles inside of the city. There are an estimated 600,000 civilians still trapped in Mosul. There is now a concerted effort to evacuate civilians out of Mosul before a full scale attack is launched against the Al Nuri Mosque and the city center. The evacuation of civilians may be a demonstration of God’s grace because I believe that the Prophet Nahum predicted the flooding of ISIS in Mosul. According to Nahum, the flood will come when they are gathered closely together. The verse below says that ISIS will be wrapped up like brambles ready to be burned in a fire. The Prophet Nahum predicted the flooding and destruction of the ancient Assyrian capital city of Nineveh. Nineveh was flooded and completely ransacked in 612 BC. Today the northern Iraq city of Mosul is built around the ruins of Nineveh. Mosul is still called Nineveh by local Iraqis. Bible prophecy often has multiple fulfillment. Nahum may have also predicted the flooding and destruction of ISIS in Mosul. History reports that In 612 BC water from the Tigris River rose up to the city gates of Nineveh. The flood waters washed out a nine hundred foot long section of the city walls along the Tigris River. Afterward the Babylonians, Persians and Medes ransacked the city for two months until nothing was left. Today the same three armies are besieging Mosul. Getting back to the Mosque; Nahum also predicted that Nineveh’s palace (or large meeting place) would be dissolved in the flood. Back in 612 BC the palace of Assyrian King Sennacherib was plunged into the flood waters. Amazingly the ruins of Sennacherib’s palace have just now been rediscovered for the first time since Nineveh was flooded. ISIS is making a stand at the Al Nuri Mosque. Nahum may also be identifying the Al Nuri Mosque as “the palace” in the following verse. In the verse below, Nahum identifies a certain wicked person that has come out of the city. This may be identifying Assyrian King Sinsharishkun who was in the city of Nineveh when it was destroyed. However, there have been unconfirmed reports that ISIS leader Abu Bakr al-Baghdadi has recently fled Mosul and is now hiding in nearby desert towns to the west. Al-Baghdadi may be better described here. Nahum describes an overrunning flood that will cover the city. He says that the city will look like a water reservoir for many days (Nahum 2:8). Nahum’s prophecy was fulfilled in 612 BC but the magnitude of the flood that he described may point to a future event. Many of the circumstances in Mosul echo Nineveh’s destruction. Today the Mosul dam is in danger of bursting. If the dam brakes it could send a seventy five foot high wave of water over downtown Mosul. Jesus promised the Jewish religious leaders that he would give them one sign that he was truly their Messiah. He promised to give them the sign of the Prophet Jonah. Jonah spent three days inside of the belly of a fish. After Jonah was spit out he went directly to the city of Nineveh. Matthew 12:38-41 Then certain of the scribes and of the Pharisees answered, saying, Master, we would see a sign from thee. 39 But he answered and said unto them, An evil and adulterous generation seeketh after a sign; and there shall no sign be given to it, but the sign of the prophet Jonas: 40 For as Jonas was three days and three nights in the whale’s belly; so shall the Son of man be three days and three nights in the heart of the earth. 41 The men of Nineveh shall rise in judgment with this generation, and shall condemn it: because they repented at the preaching of Jonas; and, behold, a greater than Jonas is here. The flooding of Mosul may be the one and only sign that will be given to Israel before their time of tribulation begins. Jesus is the true Messiah of Israel. Repent! Turn away from your unbelief and humble yourself before Jesus Christ. לפנות את הכפירה שלך צנוע עצמך לפני ישוע המשיח. Read my verse by verse Bible commentary through the book of Nahum titled The End of ISIS is near! Read my book The End of ISIS is near!